I had no idea these were available. 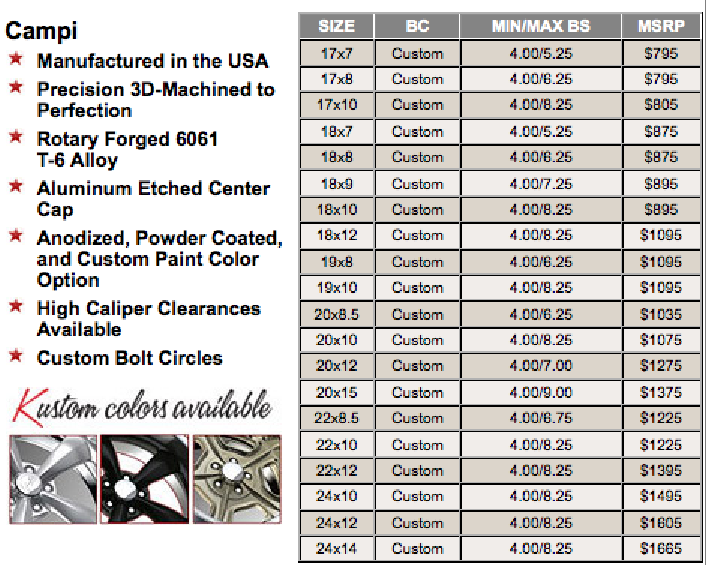 American Republic Wheels has a Boyd Coddington USA web address. 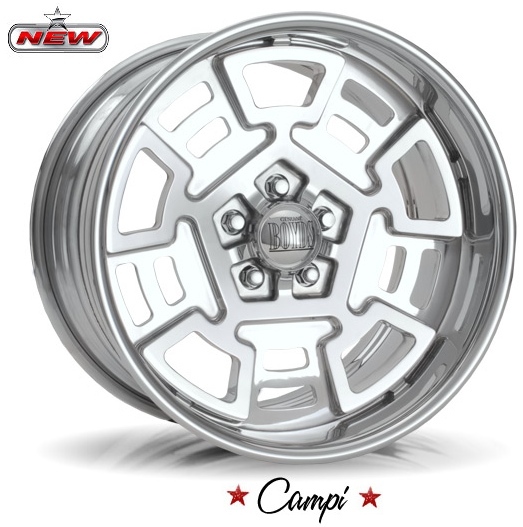 The "Campi" wheels are among the "Elite Series" of wheels. The center appears to be the same style/design that Coddington supplies to Marino Pena at Pantera East. But the outer rim is decidedly different. A post to the POCA Forum says a recent buyer found some minor caliper interference issues, though. I have a set of 17x8 and 18x12. They look great. Since the centers are larger than most, they look more open and "show-off" my stock brakes. It looks like time for a brake upgrade. Tire valves are inboard. There's a potential clearance issue with the rear uprights. I need to use flush tire valves. When it's all settled, I'll learn how to post pictures. Would like to see pics when available/possible. Time has taught us that the tire industry is evolving, and that older tires (designed for smaller wheels) are not well supported by the tire industry. Tires for 17" wheels just aren't being supported these days any better than tires for 15" wheels. The vendors selling Campy Clone wheels have not kept-up with modern tire sizes. They are selling expensive wheel sets for tires that in some cases aren't available in matching sets, that have only one choice in make and model, or that have "off-again/on-again" availability issues. 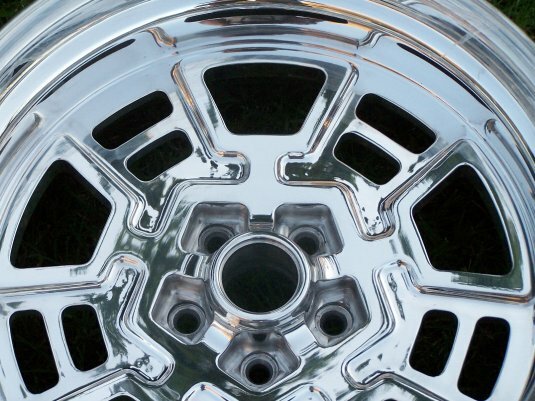 The centers of the Boyd Coddington wheels (now American Republic Wheels) have 3 dimensional "depth" like the OEM Campy wheels, more so than other Campy clone wheels. For instance the frames around the "windows" tilt outwards at an angle whereas other Campy clones are flat as a pancake. To machine the wheel at multi-angles like that requires more time on the CNC machine, and makes the wheel more expensive. These wheels are gorgeous, and I believe they are a good option for Pantera owners. Boyd Coddington is under new ownership, it is owned by American Republic Wheels now. Please be forewarned their standard "Campi wheel" spec is a rather generic style wheel spec. The "Campi" wheel is not being marketed as a "Pantera" wheel, its for owners of classic American hot rods and muscle cars who like the Campi look. The "generic" wheel lacks the features listed above that were found in the wheels formerly produced for Pantera East. If you want a wheel that is more Pantera-specific or similar to the Pantera East wheel, be sure to start the exchange by explaining you are ordering wheels for a Pantera AND want wheels machined and assembled to the former Pantera East specification, except in terms of diameter, width, and offset. Be specific with what you're looking for. They have a CNC program for the Pantera East wheel, owners have been able to have wheels produced to that spec. If you do business with them, please share with us your experiences. I welcome the availability of Campy clones in modern sizes. There's no reason to buy those old school 17 inch wheels any longer, Campi clones can be acquired in 18 or 19 front, 19 or 20 rear. I wish I had known about these wheels when I purchased the HRE wheels for 6018 ... I would have preferred the Campy clones (would have been $1420 less expensive than the HRE wheels too). Thanks for posting this Larry! 18 or 19 front, 19 or 20 rear. Just because you now CAN, doesn't make it a good idea. I'm with you on that Larry. I'm not a fan of the thin tires. I wish they'd start making tires in "45" series again. I like 'em big and fat. Some larger wheels were available two to three years ago...in the "George size" not sure, but they were available in 17's & 18's which I got. I think it was a matter of just using a larger hoop 19 & 20 and those were available....the CNC program, I assume could easily change that dimension. Below are the wheels I purchased directly from Coddington in 2007. It took me about six months to get Coddington to get an agreement from Marino to allow them to make the wheels in the sizes I wanted. Marino would not make them in the size I wanted...so he allowed Coddington to make them for me. I've heard that Coddington (Boyd Jr) does not make Mario's wheels anymore??? Can anyone confirm that? I was thinking that Boyd Sr. died and the wheels business was sold to Wheel Pro's it made the exclusive contract for these wheels for Marino ONLY invalid? Here's a close up of the wheels...they are really a quality wheel. Larry, the hoop is available in either a smooth lip (Smooth lip is what you posted) or the Traditional lip, the latter being more period correct with the Pantera. I chose the Tradition lip...its a matter of taste. From what you posted, I would venture any request for traditional lip wheels would result in a refusal or another lengthy negotiation with Marino. They seem to have skirted the issue legally (though not ethically) with the new lip design. 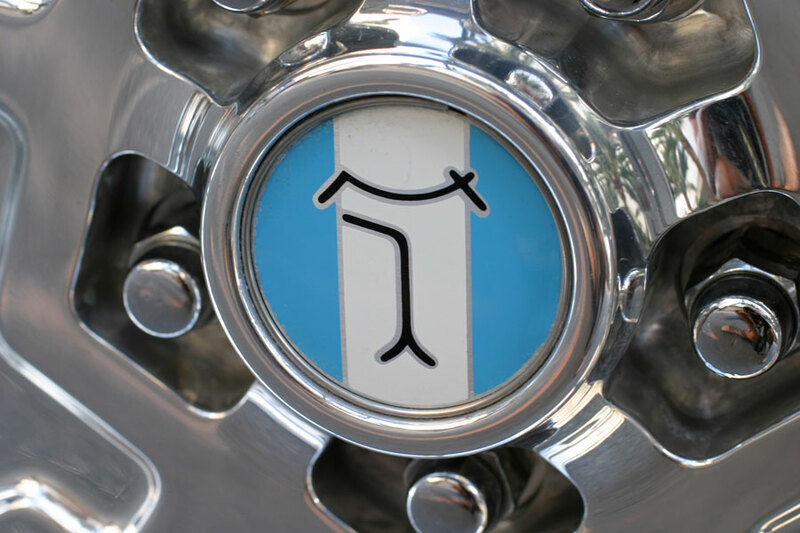 I'm looking for center caps that work with Campy emblems. Did your wheels come with a "flat" cap? Mine have the "Boyds" dome center caps. closeup picture with rotated center. That is the design that some other vendors get. Yup, that is what Byars did. And I'm with you, that one little change is all wrong. I'd have refused them, too. But most buyers probably never notice - which is what Byars was betting on, IMHO. I got a different cap...I think it says Coddington. I'll post a picture. The caps that came with mine didn't fit actually...supposedly my centers are setup to take the deTomas emblem. Brain, mine are the dome cap also, but mine have "Boyd Coddington" script. The opening on my wheel where the center cap would go is pretty close to 2.375 inches across. What is yours? Chris Coddington told me that the wheel center hole for the emblem was the same size as the original Campy wheels and all you had to do is buy the replacements from one of the vendors. The picture below shows the emblem I want which I believe is either a reproduction or original...either way they look better than the dome. There is a post on the Provamo site that says they are for sale? I will let you know if I find them. Wilkinson, or just about any vendor. Get the retainer rings, too. Thanks guys. Those are just what I'm looking for. I'll make sure to get retainer rings as well. or maybe not? I measure 3" outside diameter and ~2.75 inside. I call and they suggested to buy 3" centers from a 3rd party. When I have all tires mounted, I'll pursue it further. Inboard tire value near rear upright. I'm thinking standard valves won't work. Front side view. I was concerned about too much front space. After looking at both, the 83deg stems look better. They don't require an adapter and are just over 1/4" from the rim. More test fits ahead. Any other ideas would be welcome. I'll have a front tire mounted soon and post photos of the 17x8s and 18x12s on the car. Right after these photos were shot, I spun rod bearing and the engine's now the priority. But, that's a post for another area.. The new rear tire/wheel sits nice and fits the wells nicely. Please do pic of the new front wheels mounted when available. 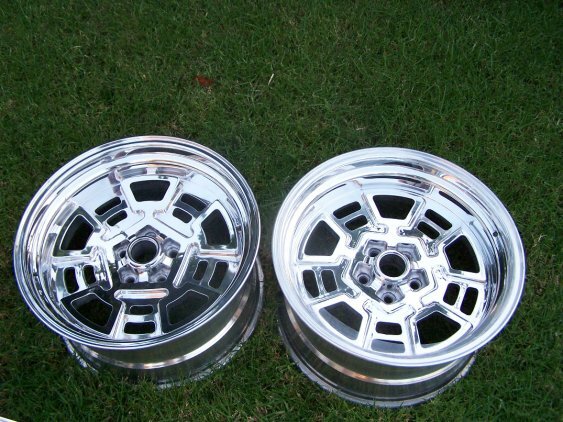 I currently have 17x9/17x11 Campi clones on my car but have considered upgrading. Best regards and congrats on your upgrade. Those big tires will also cause body flex for the same reasons. Chassis braces and especially a proper bay brace that reaches all the way back into the welded pockets of your inner rear fenders may help prevent paint (and fender panel) cracking. Thanks for the kind words. I'm in a holding pattern waiting for an engine. Once that's cleared up, I'll mount the rest of the tires and get final clearances. It sounds like your 17x9s are wider than my fronts. 2. Brake lines: Stock brakes with SS lines rub the inner wheel wells. I'll look for fittings until I do a brake upgrade. 3. Valves: The flush Mr. Gasket valves work, but require an adapter to fill. Since the valves on the wheels are in-board, I may have to remove the tire to check/adjust pressure. I'm hoping the 83deg values are an answer. They are better quality than the cheap flush valves. Initially, I was after PE Campys, but after 3-4 weeks, it became clear that they were not an options. At that point I went direct and got wheels with significantly different rims. I'd say the centers are campy clones, but the rims are very resto-mod. Yes, definitely, first things first. Addressing the immediate issue with the engine is a priority. I am also dealing with the same issue which I am hopeful to get resolved by the end of this month with another motor I just built. I am very interested in seing what you come up with on your wheel upgrade when you get around to it. Pantera East one-slot campy clones for my pushbutton. Glas-blasted and powder coated. The center piece look very similar to the Boyd-wheel - except maybe that Boyd's doesn't look to have the double-angle finish in the one(or two)-slot area. Wasn't that Marino's original design ? I REALLY can't wait to see your car come together, those wheels with the 'flat' finish = awesome, exquisite taste! I am thinking about purchasing a set of American Republic Wheels for my 73 L stock body. Front size would be 17x8. Rear size would be 18x11.5. This way I could run either a 315/30/18 or 335/30/18 rear tire. What would guys recommend for back spacing? I was thinking 7" b.s. or 6.75? I don't want them to stick out. Any suggestions or fitment issues? Does anyone know the b.s. 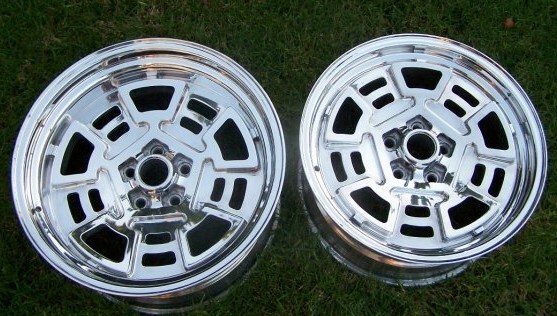 on the Pantera East 18x12.5" wheels? Not sure of max back spacing possible without inside of tire hitting frame. I have 335/30/18 with 7" backspacing and the upper part of tire is removing paint from frame. Now in process of making hub centric spacers to compensate. This is a picture with a 18 x 12 wheel - 6.75 backspace running a 335/35r18 tire. I think a 12.5" wide wheel would stick out. The inner fender clearance is tight with the 12" wide wheel and 6.75 BS. I wouldn't want it to stick out or in any further with the 12" rim. For a 12" wheel I'll recommend a 6.75" backspace, and depending on how far you want the wheel to stick out, 12" wide rim for almost flush, 11 rim" for inset 1.1" from the outer fender, or you could split the difference with a 11" wheel and do a 6.25 backspace and have .5" inset from fender and a larger clearance between the wheel and inner fender well. Racing motorcycles and Bonneville cars run bent valve stems with the cap end set in the trailing position, to lessen the possibility of centrifugal force sucking the valve core down & losing air at the worst possible time even with a cap. The usual ones are 80 degree aluminum valves. They will not fit a stock Campy drilling but for your aftermarket wheels, they may fit or simply drill a new hole. I got mine decades ago; Google 'angled valve stems'. brother bee and mister solo thanks for the advice, I apprectiate it. Mister solo thanks for the picture. Looks nice. I also like the BFGoodrich tires on your car. Thanks guys for the replys. What do you guys think about a 6.75" b.s.. I also don't want them to stick out past the fender. Rim size would be 18x11.5" but with the flanges included it would be 12.5". Owners with the 12.5" rims, are your rims actually 13.5" from flange to flange? Yes, a 12.5" wheel is 13.5" wide, measured outer flange to outer flange. Backspacing measurements include a 1/2" allowance for flange width. Thanks David. Prior to this enquiry, I used to think(incorrectly) that a 12.5" rim measured 12.5" flange to flange, but now know that this is actually the number from bead to bead. 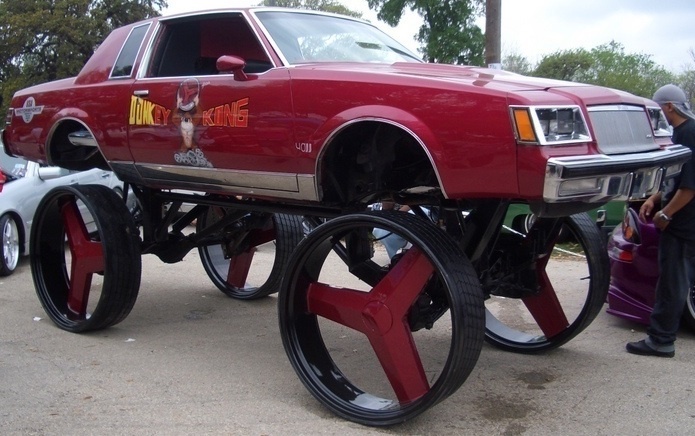 Since I am thinking about having the rear rims modified, I just don't want to end up with something that doesn't fit exactly correct. Once they are made I own them. 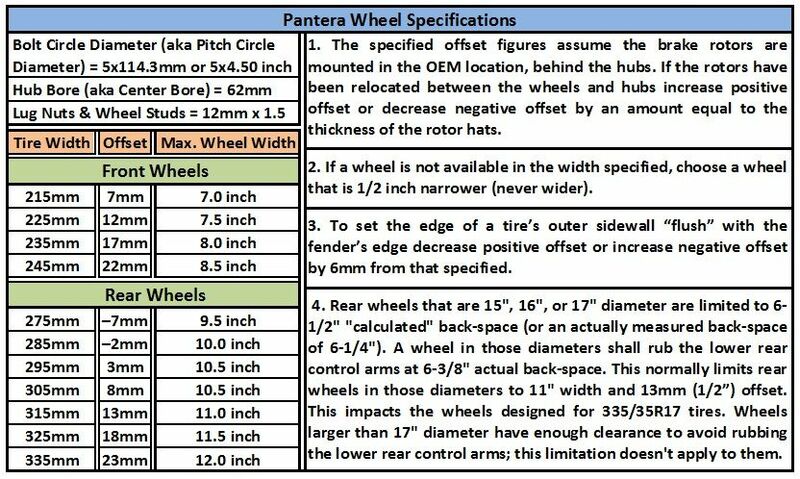 The information below is our current best recommendation regarding the subject of Pantera wheels (as of February 2017). Both the wheel width and offset are very specific for one tire width, they are not useful for someone seeking a specification for one-size wheel that fits several size tires. This is the way it is with these modern short sidewall tires. The idea is to achieve the best appearance possible for your rolling Italian artwork (valued at $80,000 USD). Second I'd like to mention feedback I've read here in the forums regarding the wheels themselves, and feedback regarding doing business with American Republic Wheels. The centers of these wheels have 3 dimensional "depth" like the OEM Campy wheels, more so than other Campy clone wheels. For instance the frames around the "windows" tilt outwards at an angle whereas other Campy clones are flat as a pancake. To machine the wheel at multi-angles like that requires more time on the CNC machine, and makes the wheel more expensive. 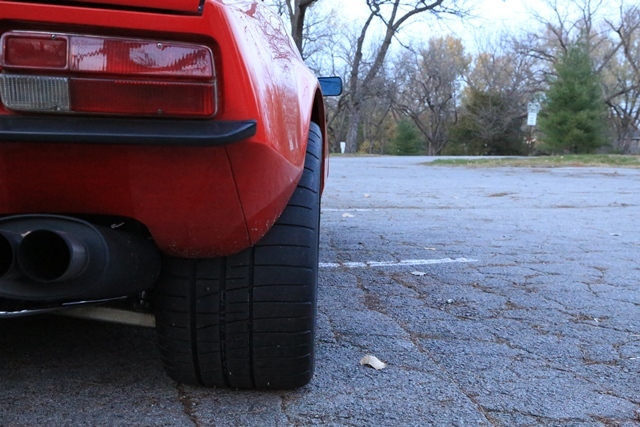 These wheels are gorgeous, and a good option for Pantera owners. The intermediate step I refer to can be seen in the picture at the bottom of this post (its a picture of Tom's wheels which I borrowed from page 1 of this thread). 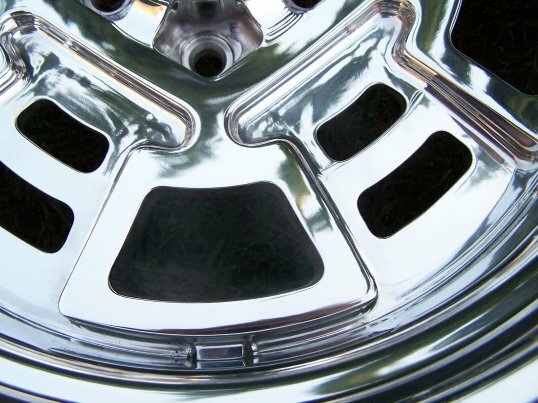 It looks less like a "step" and more like a "ring" surrounding the wheel center in the picture, but that is simply due to the angle of the photo and all the polished aluminum. Boyd Coddington is under new ownership, it has been American Republic Wheels since 2010. Please be forewarned their standard "Campi wheel" spec is a rather generic style wheel spec intended for owners of classic American hot rods and muscle cars who like the Campi look. It lacks the features listed above that were found in the wheels formerly produced for Pantera East. If you want a wheel that is more Pantera-specific or similar to the Pantera East wheel, be sure to start the exchange by explaining you are purchasing wheels for a Pantera and want wheels machined and assembled to the former Pantera East specification, except in terms of diameter, width, and offset. Be specific with what you're looking for. They have a CNC program for the Pantera East wheel, owners have been able to have wheels produced to that spec. Doing business with American Republic Wheels has been an exercise in frustration and disappointment for some folks. These wheels are a nice option for owners, it would be a shame to write-off this business. So I'd like to read about both the positive experiences and the problems our members have encountered. If you have done business with them in the past, please share with us your experiences with us. This will help your fellow Pantera owners decide whether or not to do business with this company; perhaps you can share the pitfalls you encountered so that others may avoid them. George, my wheels are the same as in the picture. I asked Dave if he could resurrect the old program to make these wheels. It took a while to get them, but was okay since I wasn't in a hurry. The rear size is 18x11.5. I have the option of three different sizes. 295/35/18,315/30/18, and 335/30/18 which is the size that I went with. OEM center caps fit. I didn't like the newer version(the rims that are pictured on their website as much) which is why I wanted the rims that were made a while back. I think these wheels are the closest replica's to the original Campy.